Actress and singer Debbie Reynolds died Wednesday, a day after the sudden death of her daughter, "Star Wars" icon Carrie Fisher. Reynolds was 84. "She’s gone to be with Carrie," Reynolds' son, Todd Fisher, said in a statement. "She loved taking care of her and now she’s gone to be with her." Reynolds was rushed to a hospital from a Beverly Hills home at around 1 p.m. PT, according to law enforcement officials. Todd Fisher confirmed she had died Wednesday evening and later told "Variety" he blamed heartbreak for his mother's death. "I miss her so much. I want to be with Carrie," Reynolds said hours before she died, Todd told the magazine. There was no immediate word on her cause of death. The back-to-back loss of the mother-daughter duo, each Hollywood fixtures of their own generations, stunned fans and fellow celebrities. Carrie Fisher died Tuesday, days after suffering a heart attack on a plane. She was 60 years old. "I can't imagine what Carrie Fisher and Debbie Reynolds' family are going through this week. I send all of my love," TV host Ellen DeGeneres tweeted. Reynolds catapulted to fame after her first leading role in 1952 at age 19, when she played Kathy Selden in "Singin' in the Rain," which also starred Gene Kelly and Donald O'Connor. As an actress, dancer, and singer, she became America's sweetheart — and a triple threat among performers. "She sang the most cheerful song in film history," James Lipton, host of "Inside the Actors Studio," said on MSNBC's "The Last Word with Lawrence O'Donnell," referring to the song "Good Morning" featured in the beloved musical. "And she held her own," Lipton added, referring to how young Reynolds was at the time and the fact that she starred alongside Hollywood veterans. "Can you imagine being thrust into that?" Reynolds herself admitted in an interview once that working with Kelly and O'Connor at just 19 was intimidating. "They had been dancing for 30 years. I was dancing for three months, so I was hysterical," she said. Born April 1, 1932, Reynolds worked the beauty pageant circuit before she made her film debut in 1950 in the musical "The Daughter of Rosie O'Grady." In 1964, she earned a best actress Oscar nomination for the 1964 drama, "The Unsinkable Molly Brown." Then in the late 1960s, the actress starred in the "The Debbie Reynolds Show," a short-lived sitcom on NBC. For the next two decades, Reynolds turned her attention to the stage, performing on Broadway and in Las Vegas. She continued to appear in films throughout the 1990s. In all, Reynolds appeared in dozens of films, television shows and stage productions, and was nominated for multiple Golden Globes and Academy and Emmy Awards. Reynolds' career spanned nearly seven decades, and she appeared in some of the most iconic films of the 20th century. Her personal life was almost as scintillating as the movies and shows she was in. She was the first wife of pop star Eddie Fisher in 1955, who later divorced her in an infamous love triangle to marry Reynolds' best friend, Elizabeth Taylor. Reynolds and Fisher had two children together, Carrie and Todd. Reynolds then married shoe Mogul Harry Karlin in 1960, before getting divorced in 1973. Her third marriage was to real estate developer Richard Hamlett in 1985. The two divorced in 1996. "I don't choose well. I don't blame anybody but myself, but I just seem to have very poor taste in men," she once recalled in an interview. Celebrity tributes poured in after Reynolds' death. "Debbie Reynolds was one of the last of Hollywood Royalty. It breaks my heart that she is gone," actor William Shatner said in a tweet. "I'd hoped that my grieving was done for 2016." Actress Anna Kendrick called her an "American treasure." Actor and filmmaker Albert Brooks called Reynolds "a legend and my movie mom." Reynolds and Carrie Fisher had a volatile relationship that eventually smoothed out as the two grew older and closer. Fisher often spoke of the ups and downs in her relationship with her mother, and what is was like growing up in the shadow of famous parents. In 2012, Fisher told TODAY the relationship between them was "certainly not ... typical." "But now I have officially turned into my mother. In our family, to turn into one another we do night club acts," she said, in reference to her one-woman show "Wishful Drinking." 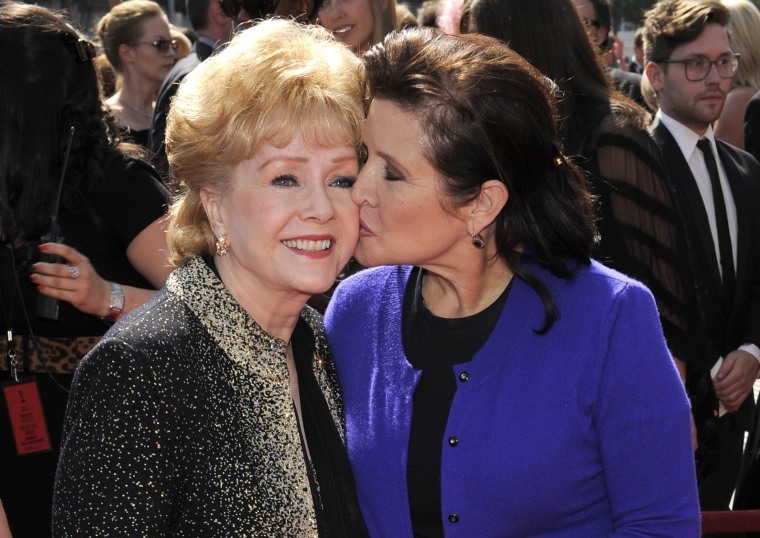 The two appear side-by-side in a 2016 documentary called "Bright Lights: Starring Carrie Fisher and Debbie Reynolds." The documentary premiered at this year's Cannes Film Festival and is set to air on HBO in March 2017. Fisher's half-sister, Joely Fisher, earlier tweeted well wishes to Reynolds and said later Wednesday she was "inconsolable." After Carrie's death, Reynolds on Tuesday thanked those who "embraced the gifts and talents of my beloved and amazing daughter" in a Facebook post, adding, "I am grateful for your thoughts and prayers that are now guiding her to her next stop." The double tragedy in one of Hollywood's most famous families left fans reeling. "God, I'd love to know what Carrie Fisher had to say about all this," tweeted one.